Wild Wednesdays, Friday and Saturday Specials, and Surprise Spins Sundays are the regular casino promotions available at All British Casino, one of the many reasons I can highly recommend this British NetEnt Casino. 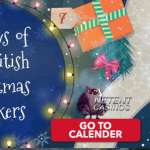 Besides, your adventure at All British Casino starts with an incredible welcome package which consists of a 100% welcome bonus and 100 free spins for a number of NetEnt slots. 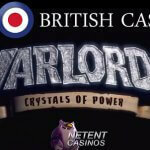 read more about this British NetEnt Casino, their welcome package and how you can unlock 60 free spins for the Warlords™ slot tomorrow 3rd May. British, or not, you’re always welcome to join the club. However, only players from Britain qualify for the welcome bonus offered by All British Casino. All players from other locations will not be awarded the welcome bonus, but if you join this popular British NetEnt Casino at the right time, you won’t be with empty hands. So let me guide you through the process of joining All British Casino at the exact right time in the next couple of days. Whatever option you are, the following link will lead you to All British Casino. British or not British, you already have an account and made at least one deposit in the past 30 days. You’re looking for a British NetEnt Casino and you’re British which means you qualify for the 100% welcome bonus and the 100 free spins. In this case, I can highly recommend you to sign up today before 23:59. Once registered, you’ll be able to make a deposit for the first time. If you make a deposit before 23:59 today, you not only receive a 100% welcome bonus and 100 free spins but you’ll also have an advantage regarding tomorrow’s free spins promotion involving the fantastic Warlords™ slot. You register at All British Casino today. You make a deposit today. You receive a 100% welcome bonus up to £100 and 100 free spins for Starburst™, Pyramid™ or Aloha!™. This is when you have to forget about the welcome package as it won’t be available for players residing outside the UK. But listen, you still have lots of reasons to consider All British Casino. You’ll never be with empty hands, as long as you sign up at the right moment. In your case, not being Britain, you can still enjoy the best British NetEnt Casino around, simply by registering today. If you register today and you make sure you make a minimum deposit of £10 today before 23:59, you won’t be awarded anything extra today, but you will tomorrow. To qualify for tomorrow’s 10 free spins for the Warlords™ slot, you must have played with real money in the past 30 days before the start of the promotion. This means that you only have today to become a real money player at All British Casino. If you indeed become one today, all you have to do to receive your 10 free spins for the Warlords™ slot is to login tomorrow, 3rd of May, on your brand new account. Your 10 free spins will be available straight away. If you want to get the most out of tomorrow’s free spins promotion at this British NetEnt Casino, you make a deposit today and another one tomorrow. If you do so, 10 free spins will be available when you log in and another 50 free spins for the Warlords™ slot will be awarded when you make a deposit of at least £25 tomorrow. 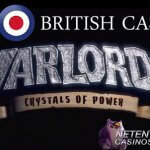 If one deposit of £25 is all you can afford, for now, I recommend you to make a deposit tomorrow in order to activate an incredible 50 free spins for the Warlords™ slot. So you won’t be eligible for the welcome package anymore but you’re one of the loyal players that appreciate All British Casino for their wide range of games, many payment methods, promotions, and their friendly customer care. Have you’ve been playing with real money in the past 30 days? 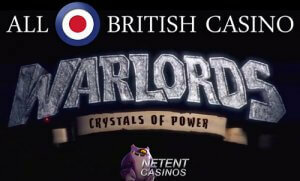 If the answer is yes, make sure you log in tomorrow at All British Casino to activate 10 free spins for the Warlords™ slot. If you want to receive another 50 free spins for this recently launched NetEnt slot, a deposit of £25 tomorrow will do the job. Why this British NetEnt Casino in particular? Looking for a British NetEnt Casino, I now gave you a good idea of what advantages are waiting for you at All British Casino. But lots of promotions isn’t the only reason you should go for All British Casino. I have been writing about All British Casino ever since this NetEnt Casino was established five years ago and this NetEnt Casino keeps on receiving good reviews. I know there’s a passionate team behind All British Casino and all they want is the fellow British to be happy and proud. That’s why every detail; has to be perfect, from the range of casino games to the list of payment options, the many promotions and even more important, a friendly and helpful customer service. While it’s normal to have a look into the above aspects of an online casino, players often forget to check the casino licenses an online casino is operating with. At this British NetEnt Casino, you have nothing to worry when it comes to licenses as two of the most important licenses are in the possession of this British NetEnt Casino. 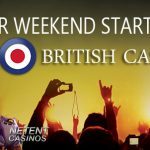 While the Maltese license makes it possible for non-British players to join the fun at All British Casino, it’s the British casino license that allows the British to play at this NetEnt Casino. The Government of the United Kingdom has fully regulated and given the right to All British Casino to offer online casino games in the UK which is, of course, of big importance for a British NetEnt Casino. Also, All British Casino takes great pride in offering its players the highest possible chance of winning through having a very high payout rate with the entire selection of NetEnt Games running on an RNG (Random Number Generator). All of them are certified by the UK Gambling Commission and Maltese Gaming Authority and, therefore, they can’t be manipulated. If all of this doesn’t convince you yet, you must be a picky player. But that’s a good thing, as you can never be careful enough. So why not just try out the popular NetEnt Games without signing up. All of this British NetEnt Casino’s online games and mobile games are available as fun games and, therefore, you can play them without signing up or making a deposit. The perfect way to become familiar with All British Casino before trusting your pennies to them.